Design Registers | View by object | Ceramic shapes | Miscellaneous | Set of door furniture consisting of door handle & fingerplate. You are here: Home > Exhibitions > Design Registers > View by object > Ceramic shapes > Miscellaneous > Set of door furniture consisting of door handle & fingerplate. 228572 - Taylor, Tunnicliff & Co - 12 April 1869 - Set of door furniture consisting of door handle & fingerplate. Address: Havelock Works, Broad Street, Hanley, Staffordshire. Subject of design: Set of door furniture consisting of door handle & fingerplate. For Complete Registration. 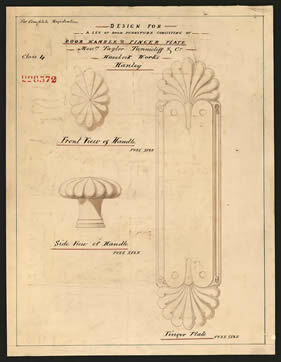 DESIGN FOR A SET OF DOOR FURNITURE CONSISTING OF DOOR HANDLE AND FINGER PLATE Messrs Taylor Tunnicliff & Co, Havelock Works, Hanley. Front View of Handle FULL SIZE. Side View of Handle FULL SIZE. Finger Plate FULL SIZE.